Today the U.S. Senate voted to pass the Cybersecurity Information Sharing Act (CISA), a profoundly unpopular cyber surveillance bill that expands and codifies the U.S. government’s unconstitutional spying programs while completely failing to prevent cyber attacks. This vote will go down in history as the moment that lawmakers decided not only what sort of Internet our children and our children’s children will have, but what sort of world they will live in. Every Senator who voted for CISA has voted for a world without freedom of expression, a world without true democracy, a world without basic human rights. But perhaps most importantly, they have voted to make utter fools of themselves and proved that they have absolutely no clue how to prevent cyber attacks. By supporting a bill that has been resoundingly rejected by security experts, tech companies, and advocacy groups from across the political spectrum, these politicians have highlighted the brokenness of our political system and exposed the reality that U.S. Congress is one of the Internet’s greatest foes. If President Obama doesn’t veto this bill, he’ll be showing that his administration never cared about the open Internet, despite his posturing on net neutrality. Everyone knows that CISA is not what these corrupt politicians are claiming it is. Thanks to the Internet, it’s already easy to see when Congress is being clueless and dishonest – soon, we’ll be able to hold them accountable too, and it’s only a matter of time. There is so much more that internet users can do to defend their privacy from this Congress. Fight for the Future will continue to fight on the frontlines to protect the Internet as a powerful platform for freedom of expression and social change. In the coming months, we will be returning to our campaign to defend and expand the use of strong encryption: Reset the Net. 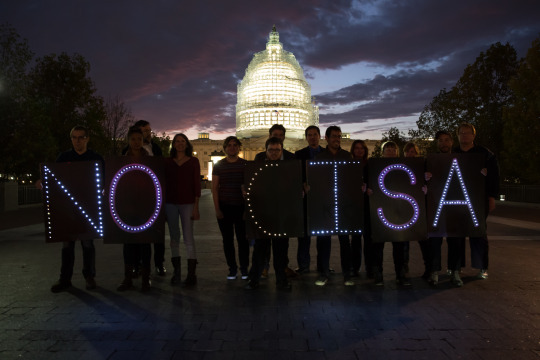 Despite today’s vote, the fight over CISA is not over yet. The bill must still be “conferenced” with similar legislation in the House of Representatives, and then signed by President Obama. Fight for the Future intends to fight this dangerous measure at every step, and will hold lawmakers and companies accountable for supporting it or standing idly by and allowing it to pass. For more on Fight for the Future’s recent campaigns around CISA, which have generated millions of messages to Congress against the bill and lead to an avalanche of large tech companies coming out in opposition, see this previous release, which includes high-resolution photos of CISA related protests that are available for use by press. Note: Greer’s pronouns are she/hers.